Workpoint TV began terrestrial digital broadcast service in 2014 as Workpoint TV 23, broadcasting programs with headline news every hour. The popularity of PlayBox Technology in Thailand is validated by major upgrades and new AirBox installations at several facilities. Bangkok-based digital television broadcaster Workpoint TV, added the latest-generation PlayBox Technology AirBox Neo and ProductionAirBox Neo. Workpoint TV produces a wide range of content including news, music and variety programs for transmission via the Thai digital television network, on satellite and online. "Workpoint TV selected AirBox as the heart of its playout facility right from the start of test transmissions in 2011," says Apichart Prugtayanon, Project Manager at PlayBox Technology Thailand. The new AirBox Neo and ProductionAirbox Neo are being used to handle outside broadcast coverage of concert stage events and sport, including live inserts which can be added easily between pre-scheduled events. The entire process from ingest to transmission is in high-definition. ProductionAirBox Neo adds exactly what Workpoint TV needed to provide dynamic coverage of content coming in from auxiliary studios and from events covered by a mobile production team. Spring News won the license for a terrestrial digital television for news and information channel from NBTC's spectrum auction in 2013. Television news broadcaster Spring News upgraded its playout system to a latest-generation AirBox Neo from PlayBox Technology systems. 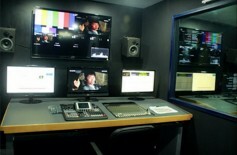 The project was completed in partnership with Singapore-based broadcast system integrator GBS Alliance. "We have operated with AirBox as the core of our broadcast playout system for many years," comments Spring News' Director of Engineering & Information Technology Tawatchai Homhual. "AirBox and its various elements form the nucleus of an extremely reliable system. Our operators like the logical and versatile user interface which lets them achieve their goals quickly and easily. The system is very flexible to configure, highly reliable and supported online by PlayBox Technology from its European headquarters as well as here in Bangkok from PlayBox Technology Thailand." The upgrade moves Spring News forward from standard definition playout on a Windows XP server platform to 1080i high definition, installed at the channel's headquarters in Bangkok and operated from its master control room. Spring News 19 has access to ongoing enhancements to AirBox Neo and all other modules in the Neo product series as these continue to develop. STG serves consumers and advertisers in strong local markets by providing top-rating programs from around the world that fit consumers' needs. STG Mediaplex is another of Thailand's most active television content providers. STG Mediaplex has chosen a complete AirBox Neo playout and TitleBox graphics generation system for a new high-definition TV channel. The channel will be streamed to viewers via OTT.